Besides subways, public buses are the cheapest way to get around Beijing. 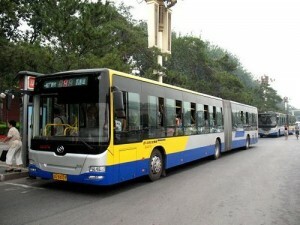 This page will focus on the information of Beijing bus. The public bus system in Beijing is well developed. You can get almost anywhere in Beijing by bus. The fare charges from CNY 1. Currently, there are over 800 bus routes in operation in Beijing, supplied by the buses numbered 1-998. They are mainly divided into the following categories. Numbered 1~100—Bus routes are within the 3rd Ring Road. 101, 102, 103, 104, 105, 106, 107, 108, 109, 111, 112, 114, 115, 118 and 124—Trolleys, most of them run within the 2nd Ring Road. Numbered 201~215—Night routes, only in operation after 23:00. Numbered 300~810—Offering bus routes from downtown area to suburban Beijing. Numbered 900~998—Running long distances, often air-conditioned such as from downtown area to the Great Wall. There are also Yuntong Buses, which the bus numbers begin with “运通”. The bus numbers begin with “特”, which means “special” in Chinese. They are double-deck buses. For buses of two doors(front door and back door), passagers should get on the bus from the front door and get off at the back door. For buses of three doors(front door, middle door, back door), passagers should get on the bus from the middle door and get off at the front door or the back door. For most urban buses, the flat fare is CNY1. Usually there are no conductors on the bus. You are required to put the money(note or coin) into the coin box. If you use a transportation card, there will be a 60% discount, that is CNY 0.4. For suburban buses, the ticket fare is CNY1 for the first 12km, CNY 0.5 for each additional 5km. For distant suburban buses, usually start with “9”, the ticket fare is CNY2 for the first 10km, CNY1 for each additional 5km. The buses charged by distance are equipped with conductors.If you use the transportation card on these buses, you need to swipe the card on the card reader when you get on the bus and swipe again when you get off the bus. Transportation Card discount available. Generally speaking, the buses in downtown area are in operation from 05:30 until to 23:00. Some suburban lines may stop as early as around 18:00. The night lines of 201~215 serve from 23:00 to the next 04:30 or 05:00. If you stay in Beijing for quite a few days, or want to have more transport convenience when you traveling Beijing by bus, you are highly recommended to buy a Beijing transportation IC card. 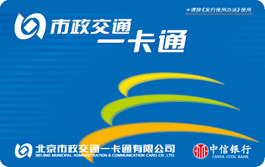 A transportation card can also be used to pay for Beijing taxi, Beijing subway and S trains to Badaling Great Wall. The official name of the IC card is called “Yikatong”, which means “one card pass” in Chinese. If you use the card to take a bus, there will be a 60% discount. That means if your bus fare is CNY1, you only need to pay CNY0.4 swiping the transportation card.